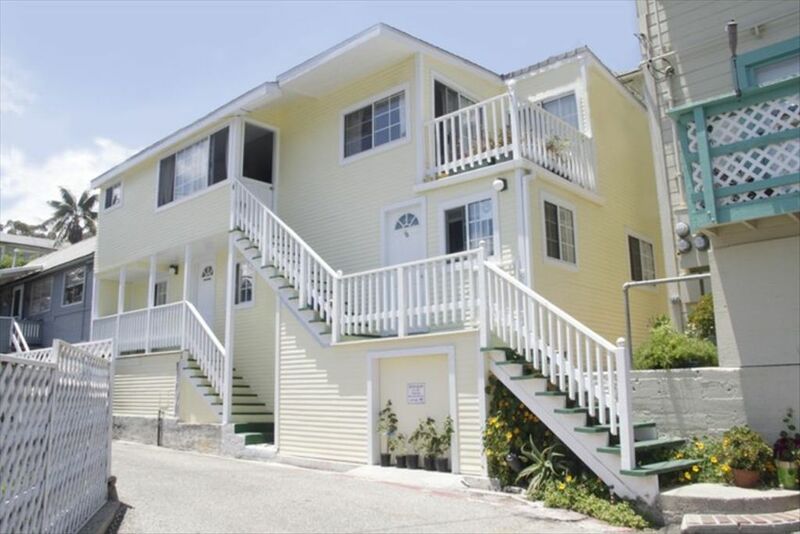 Beautiful Rental in the Heart of Avalon. Must be over 25 years old to rent! Stay at the Shelton's, a short two-block walk from the seashore. We are a family owned and operated vacation rental. Stay two nights or a month! During your stay you will enjoy all the comforts of home. The unit is fully furnished and has a kitchenette. Enjoy the mountain and city views from the balcony or walk to nearby shopping, entertainment, restaurants, boating and beach activities. This year 2017, in the Avalon Bay they have added a small water park for the kids & on the Pebble Beach Road is a brand new pirate park for the smaller children. Adults the city of Avalon added a work out park for us too, across from the city hall. The room is a one bedroom, living room, kitchenette (no stove) and a private bathroom with a shower. To keep your cool their is an air conditioning unit for the room. All in a 350 square foot area. We love meeting people and care about making their vacation a relaxing and enjoyable one. This is our 19 summer season, we have gotten to know many family while being hosts to our new friends, it's always a pleasure to see the kids grow up & face a new challenge, swimming out to the platforms, fishing, rock climbing, and even parasailing!! We are ready for your visit, can we meet the boat? then bring you up to the room. If your celebrating a birthday, be sure to tell us! We will put a birthday cake in the room for that special touch. Maybe it is a anniversary, fresh flower would be a beautiful addition to the room. You are our number one priority! When departing ask us to take you to the boat, check out is at 10 a.m. but we'll store the luggage for you, then deliver those bags to the dock, so you can explore more of the island without braking your back! Coffee & all the fixing are in the room. Bottle water is cold in the refrigerator along with bagels & cream cheese, for a simple breakfast. We take good care of our visitors! That's why they return again & again. Hope you will too. We do not have a water view, but just a 2 minute walk and your standing at Avalon Bay. One of my favorite walks is along the waterline in the evening. So peaceful and it safe to stroll along. Catalina Golf course is the oldest operating course west of the Mississippi. 9 holes, full service Pro Shop. 310-510-0530 Carts available. Miniature Golf is a block away from our house tons of fun! Step Beach is a postage stamp size bit of sand to enjoy. Life Guard on duty at times. Keep your eyes on the tide, because at high tide this is a deep water beach. Take a jeep tour offer by the CatalinaConservancy.org tons of fun! Small groups 6-8 per trip. Descanso Beach, great kayaks! www.kayakcatalinaisland.com 310-510-1226 start early, 9 am -4pm Also a bar, & hamburger stand. Rock climbing wall + zip line shopping, bring water shoes HOT Rocks. Safari Island Adventure 2.5 hours offered by www.Catalina IslandAdventureTours.com Glass bottom boat rides, Submarine, Booth is located on the Pier & the mole. We offer bath towels please bring your own BEACH TOWELS. Thank you! Great for heating up some popcorn. We provide everything you need to make a delicious cup of coffee. Coffee, creamer & sugar is waiting for you. We have beach chairs you can borrow to take to the beach with you. I’m so glad i went with this place. It was a short walk to the house from the Catalina terminal. We brought our collapsible wagon which made it so much easier. Jeanie was a great host she accomadated is based on our needs and even took the time to drive us to the terminal. Thank you! See you soon. we really enjoyed our stay here! the location was really nice and very close to the new Vons grocery store. It is very quiet as the residence is not on a through road. Jeanie is very friendly and gave us a ride to the ferry at the end of our trip. We would recommend staying here and will use it again when we come back! So glad that you did enjoy your vacation! It was our pleasure to host you ! Nice and cozy. Close to everything. Very nice and clean 1 BR apartment w fridge and microwave. Perfect for our 3-day weekend. Close to everything. Very friendly landlord with lots of info and advice. Appreciated the ride to and from the ferry. Thank you! for being such pleasant house guests. We look forward to another visit without 5 inches of rainfall while you are on the island. Very comfortable and well appointed apartment. Located a few blocks from the downtown area. Steps away from the new Vons grocery. The apartment lacks for nothing. Thank you, to be honest Vons is on Sumner Ave, our rental is the next street over. Hopefully it will be up and running by your next visit! Such is life in paradise. Such a great little spot within walking distance of all key sights in Avalon. I walked to restaurants, two snorkeling spots (Casino point and lovers bay), and the botanical gardens up to the crest trail. Jeannie is very friendly and accommodating. The cottage was stocked with plenty of waters, coffee and even a 22oz of Pacifico + wine. Would definitely stay here again on my visit to the island. The host was incredibly accommodating when our plans had to change and we were greeted with a nice hand-written note and plenty of amenities inside when we arrived. Location is excellent (easy walking distance to the town center) - would happily stay again. Thanks! FREE WIFI IN ROOM, we will be happy to meet the boat when you arrive, and bring you up to the room. Let us bring the luggage down to the boat for you, 30 minutes prior to departing! Even if you take a later boat back to the mainland. 2 Night minimum at all times. Minimum age 25 years for young adults on their own. We do not offer a golf cart because we can walk just about ever were in Avalon. The town is a walking town with limited parking. If you would like a ride up to the room, just let us know when to meet the boat. Check-in is after 3 p.m. Jeanie will open the room for you & give you the keys. Bon Voyage. Storage lockers are at the boat dock if you arrive on an early boat. CANCELLATION POLICY - A thirty (30) day notice is required for cancellations on all prior reservations. We will try to fill those dates. If we are not able to rent it out for you will forfeit the full advance payment. Rates on Holiday's are slightly higher call for pricing and availability. With a three-night minimum. Rates are subject to change without notice until reservations are confirmed. Monthly not available in the spring or summer season.